Well hallelujah and call the authorities: The socks for HWWV are nearly done. I would have completed them last night, but you know how I like to do two at a time on two circulars? It must have been Sanjaya or some other doo-dad that caught my attention and next thing I knew, I switched the yarn balls and discovered I knit the socks an extra inch, but with opposing balls of yarn. So instead of just snipping the yarn and reattaching, I yanked out the two circulars and abandoned the project. But I did fix it this morning at the LYS where everyone else seems to be untangling things or starting things or having things knitted for them, seemingly free of charge. I say people have things knitted "for them" at the LYS because I can't tell you how many days I sit there at the shop and someone comes in with a bag of yarn, presents it to the clerk, and says something like, "I think I may have dropped a stitch a few rows back, but I can't be sure. I have been using these size 17's and they hurt my arm. For all I know, the stitch--if it were a true stitch and not some sort of an accidental yarnover--is at least 12 garter stitch rows below the needles." "You say that you may have dropped a stitch 12 rows below? Can you point to the area? I mean, this stuff is eyelash and mohair intertwined. I can't tell exactly where the mistake was made..."
"That's why you're the expert and I'm not! Does the place next door serve coffee? I think I'll head on over there while you look. Okay? I'll be back in five minutes." Honestly, that's how it is. The gals at the LYS, they are saints. I guess they could charge dropped stitch searching fees, but would that be the wrong thing to do? Or is it perfectly reasonable? I have to admit: Whenever I enter a yarn store and I see a sign that says something like: "We charge $7.00 every half-hour for knitting consultations during regular hours, by appointment only" I feel somewhat disappointed. Still, there she is: Binding off, Casting on. Counting counting counting for others. Fixing broken things. Fixing unraveled would-be scarves, measuring upper arms, recalculating gauge. Chit-chatting with stinky-salad munching women waving plastic forks among the hand-paints while asserting they have no need for a man. And also, check out the tiny crocheted purse I'm making from a kit I purchased from Kpixie. I even ordered a couple extra colors of that Emmy Grande Herbs so I can make an extra two or three. Yeah, I know, I need to finish up all my projects, but come on. A gal needs to do things other than knitting, right? OMG!!! That woman was at my LYS the last time I was there, I swear. I pretended to look at books an yarn I wasn't interested in just so I could listen in on the conversation. The mistake was at the back or the front, near one of the edges, she thought, and she didn't have the right number of stitches, but didn't know if she dropped a stitch or added one, but kept knitting (about 12 rows or so) because she knew she bring it her to be fixed. Crochet kit huh? I've been thinking that I want to learn to crochet. And something small... maybe I could finish that. I do get a kick out of the "no need for a man" conversations... and stinky salad lady may be oblivious to the handpaints but she sure has her eye on those magazines. You can take your knitting to be fixed at a LYS? Well, well, well and here I am frogging like a chump! It is a dilemma though. It seems rude to charge for advice but then again, in a situation like you overheard - I sure hope she is a customer with a taste for expensive yarns at least. I feel the LYS workers' pain. Every once in a while we'll have knitters show up at our SNB with projects they're stuck on or need help with. We're happy to help, but when they are all sorted out they leave, never to be heard from again... makes you feel so... used! ooh wendy-la, so good to see you looking relieved- That picture of you is very reassuring for this blogger! 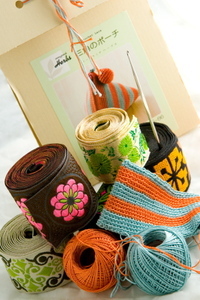 That is the yummiest picture, with the ribbons and cute Japanese pattern and yarn, of course! Your purse-in-progress is adorable! I worked at a LYS and I can't tell you how many hours of knitting triage I did on horrible eyelash / chenille / some other atrocity Ber**cco chose to produce! when i worked in a shop and was presented with this problem i would say 'i'd be happy to show you how to fix it.' imo, customers need to be empowered, not coddled. Ooooo I love that you love ribbon:). I have some in my stash, and for the life of me I have no idea what to do with it! I guess I will wait now to see what you do with it. At my LYS one perennially clueless, but definitely obnoxious knitter sat with one of the clerks sucking up her time on yet another mucked up project (using yarn from god only knows... because it was not sold in this LYS), when a paying customer asked for help. Perennially clueless, very loudly proclaimed, "She CAN'T help you now; she's working with me." The store owner finally had a little talk with perennially clueless. Amazing what these owners and clerks have to tolerate. Those eyelash problems were the ones I handed off to coworkers. I have no patience for knitting with it, let alone fixing someone elses mistakes with it. At our LYS we have set help times 3 times a week so that person is paid only to help people coming in with problems. I think that works pretty well. I'm hoarding some of that exact same ribbon. It does amaze me to hear what some people expect of yarn stores at times. But I think these people behave like that in all aspects of their lives. I'm so excited you've mentioned ribbon. My MIL has a big box of it and she said I could have it. I just don't know what to do with it. Of course I haven't started looking anywhere, but I guess my lazy side is coming out (I could say I'm too focused on current projects, but that might not be really true). So, now I know there is stuff out there to do with it, and I'll get off my proverbial rearend and start searching. I think the $7 is fair... if you need the help and value the advice, you will pay for it. If you are just being lazy, you might be more inclined to figure it out yourself if you have to pay for someone else's time. Yarn stores are businesses too, I wouldn't expect a car dealership to fix my car for free. The best thing I did when I started knitting 1.5 years ago was to learn how to read my knitting and fix my own mistakes. It just makes you a better knitter. While a LYS builds a lot of goodwill in helping people, it is quite possible that $7 sign is for those who *abuse* the free help. My LYS instituted something similar. "If you are going to need 30 minutes of help, we ask that you pay for a private lesson. If we are busy helping other customers, please wait." etc. Luckily, it's been great at my LYS lately. Some of us more experienced knitters are helping those who need genuine help. My LYS owner is a saint. But, I have heard her tell customers more than one time that she thought it was time they took the fixing mistakes class....and I have seen her hand people that same book! ROTFLMAO! I work in a LYS and SOOO know the woman you're talking about. Her:"I don't know what I did, I think I dropped a stitch" Me:"Um no, you did a short row back on the 1st row" Her:"well, I can't have, I don't know how to do short rows! Is the owner here? She'll fix it for me" Me: "No, I'd suggest ripping back to here (place marker)and starting from that point" Her: "But that's 4 rows back, can't you just fix it" THEN -Her:"ok I've gone back" ME: "UM, no you haven't, see this maker" Then I end up ripping the work back to there, picking up more then 100 stitches and giving the work back to her. Sometimes it's WAY easier to give in and do it for them. And as for arrogant or ignorant, I have no problem with ignorant, we all learned somewhere. Unfortunately, it's more often arrogant. On consultations and help at LYS's, I can't believe people would abuse the generosity of the shop owners and workers in such a way. I would pay uncomplainingly if that were the policy at my LYS, but I'm very grateful that they don't. I feel very strongly that if one can't be bothered to learn how to fix one's own mistakes, one shouldn't bother at all. I've been haunting your blog for a couple weeks now, and I just wanted to say that I think your style is really great - both the knitting and the writing. I am new to blogging, and you have definately inspired me. I may be a jerk...but I think those shop workers should hand the confused knitter a list of classes and suggest they sign up for the 'fix your knitting mistakes class'. Really. now. ya have to learn to do it yourself. Can you tell I don't like when people act all entitled? Those ribbons - you'll have to put some in your daughter's hair. My little one loves to coordinate ribbon with outfit! I go to my LYS during my lunch hour nearly every day. And nearly every day 3 or 4 of those women come in for the clerk to fix something. Some offer to pay others do not and she never takes their money. She IS a saint and she does knit on their projects for them. I'm always amazed. I don't think I could be as nice which is why I'm probably not a clerk at my LYS. that is outstandingly gorgeous ribbon... where can one find such divine ribbons? ooh do make up a pattern for a something like a pretty tube type tank with wide ribbon straps that i can buy or get free from the mag i have some lovely turquoise linen blend yarn in my stash that i would love to see made into one of those! Wow, the LYS workers at your LYS need to practice Tough Love! Or the customers need to get a life, one or the other. I saw a customer with a big load of skeins ask an employee "will you wind these for me? I don't know how to use the thingie...." and the employee said "I can't wind them for you, but I'll show you how to use the winder so you can do it yourself"